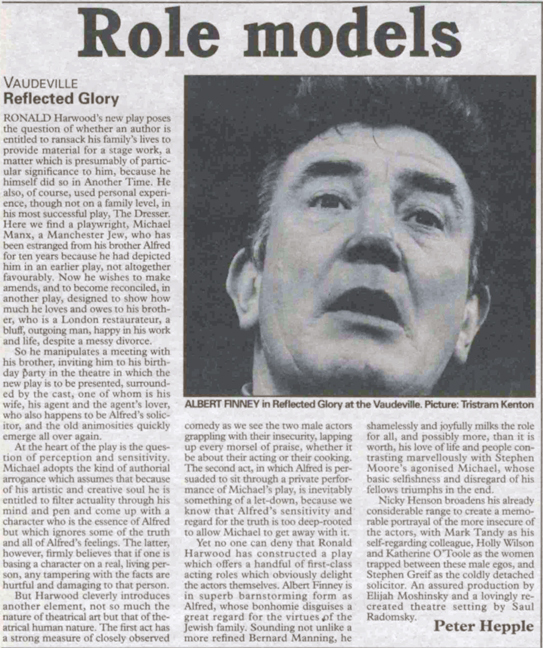 Time and talent thrust Albert Finney into the vanguard of a new generation of British actors on stage and screen. Drawn from the grittier realities of the industrialised north, the ‘angry young man’ typified by his early roles transformed the nature of British theatre and the notion of contemporary performance. Born in Salford, Greater Manchester, the son of a bookmaker father, he showed early ability at school (where he played Falstaff) before training at RADA. There, Kenneth Tynan took early note, hailing him as “a smouldering young Spencer Tracy”. A student performance as Mr Hardcastle in Oliver Goldsmith’s She Stoops to Conquer is preserved on a 1956 BBC television broadcast. The following year, he appeared as Macbeth in Birmingham and in Jane Arden’s domestic drama The Party in the West End alongside Charles Laughton, who also directed. At Stratford-upon-Avon he played Edgar to Laughton’s King Lear, Cassio to Paul Robeson’s Othello and went on for an indisposed Laurence Olivier as the titular Coriolanus in 1959. In time, Olivier would come to consider him as a potential successor at the National Theatre. With the turn of the new decade, Finney reached wider audiences on film as Mick, son to Olivier’s Archie Rice, in John Osborne’s The Entertainer and as factory machinist Arthur Seaton fulminating against his elders in Alan Sillitoe’s Saturday Night and Sunday Morning, for which he received his first BAFTA. A run of stage successes followed with Keith Waterhouse and Willis Hall’s Billy Liar (Cambridge Theatre, 1960), Osborne’s Luther (Cambridge Theatre and Broadway, where he was nominated for a Tony award in 1961) and Luigi Pirandello’s Henry IV at the Glasgow Citizens in 1963. Osborne’s film version of Tom Jones the same year gave Finney his first Academy Award nomination as the eponymous good-natured rogue. Joining the National Theatre in 1965, Finney gave a “swashbuckling… quite spectacular” performance in John Arden’s Armstrong’s Last Goodnight, blazed in the darkness of Peter Shaffer’s Black Comedy alongside Maggie Smith and delivered “a tour de force of a performance, bravura, scintillating, hilariously funny” in William Congreve’s Love for Love. He returned to the National a decade later to play Hamlet for Peter Hall (his image in character featured on a Royal Mail stamp celebrating the Old Vic in 2018) and as Macbeth in 1978. 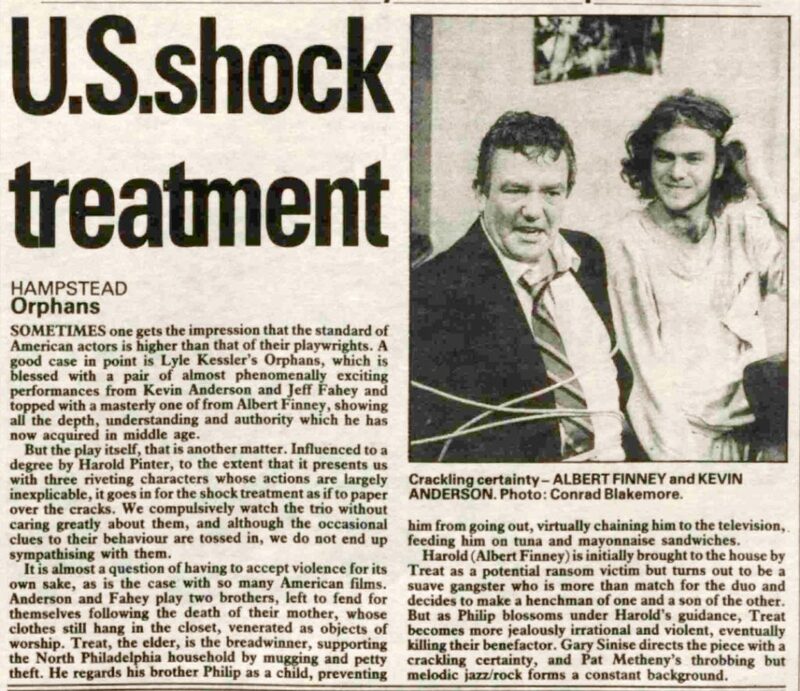 As Tamburlaine in Hall’s 1976 revival of Christopher Marlowe’s play, Finney opened the much-delayed Olivier Theatre in an Evening Standard award-winning performance that was “natural and cool at the centre but ablaze, colossal in action and aspect”. 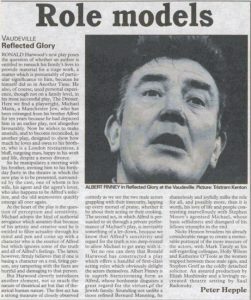 With his own Memorial Productions (co-founded with Michael Medwin), he brought Bill Naughton’s Spring and Port Wine from the Mermaid to the Apollo Theatre (1965) and Peter Nichols’ A Day in the Death of Joe Egg from the Glasgow Citizens to the West End and Broadway, where he gained a second Tony nod as Bri in 1968. Finney’s occasional directing credits included his striking film debut, 1968’s Charlie Bubbles, with a screenplay by Shelagh Delaney. On stage, he directed Harold Pinter’s The Birthday Party (Citizens, 1963), Brian Friel’s The Freedom of the City (Abbey Theatre, Dublin and London’s Royal Court, 1973), Joe Orton’s Loot (Royal Court, 1975) and Jon Blair and Norman Fenton’s The Biko Inquest, in which he also appeared (Riverside Studios, 1984). In 1986 he won an Olivier award for Lyle Kessler’s Orphans at Hampstead Theatre, transferring with it to the Apollo Theatre. Film and television increasingly took Finney away from the stage, although he was seen in three plays by Ronald Harwood: JJ Farr (Phoenix Theatre, 1987), Another Time, with Janet Suzman (Wyndham’s Theatre, 1989) and in “superb, barnstorming form” in Reflected Glory (Wyndham’s Theatre, 1992), the run of which was cut short by a dispute over delayed payments. Finney made his stage swansong alongside Ken Stott and former RADA classmate Tom Courtenay in Yasmina Reza’s Art at Wyndham’s Theatre in 1996. Courtenay was also his co-star in the 1983 film version of Harwood’s The Dresser, Finney filling the screen as an ageing actor-manager defying changing fashions, wartime deprivations and his own dwindling abilities. The more idiosyncratic his choice of film roles appeared, the more remarkable a performance they seemed to prompt, not least as Scrooge in Leslie Bricusse’s 1970 musical retelling of Dickens, a bingo-caller obsessed by Humphrey Bogart in Gumshoe (1971) and Hercule Poirot – Agatha Christie’s favourite portrayal of her Belgian sleuth – in Murder on the Orient Express (1974). No less astonishing seemed his billionaire businessman Daddy Warbucks in the lavish 1983 version of the hit musical Annie, although six years earlier Finney had recorded an LP of his own songs for the Motown label. There were more Oscar nods for Under the Volcano (1984) and Erin Brockovich (2000), with later film appearances as diverse as Tim Burton’s Big Fish (2003), The Bourne Ultimatum and Legacy (2007 and 2012) and supporting Daniel Craig’s James Bond in Skyfall (2012). Television success, capped by 14 episodes of My Uncle Silas (2001-03), proved equally varied, ranging from Dennis Potter’s Karaoke and Cold Lazarus (1996) to A Rather English Marriage, in which he and Courtenay were two widowers unexpectedly thrown together (1998). Finney’s portrayal of Winston Churchill in The Gathering Storm (2003) gained him an Emmy and his second BAFTA award. Alongside luminaries such as Diana Rigg, Glenda Jackson and John Hurt, Finney joined the board of United British Artists in 1983, a film and (later) theatre venture instigated by the impresario Lou Grade. 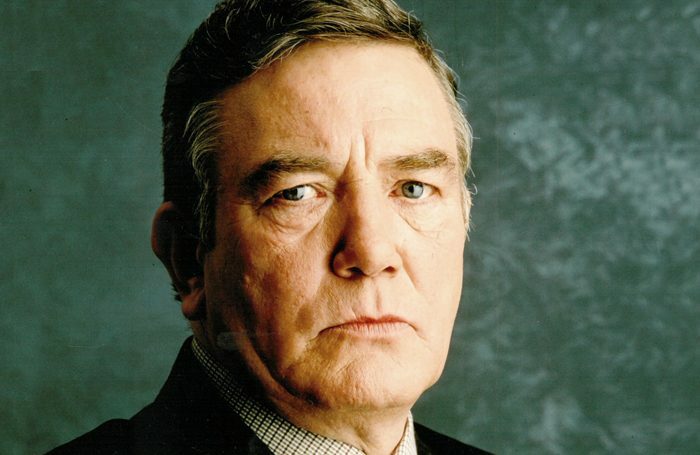 Albert Finney was born on May 9, 1936. He received treatment for kidney cancer in 2011 and died on February 7, aged 82.